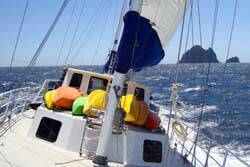 Welcome to Ecocruz, the original Bay of Islands multi day sailing cruise - enjoy the Bay the way the locals do! Join our friendly crew and discover the Bay of Islands Maritime Park on a 3 day/2 night sailing adventure aboard the Manawanui, a 22-metre ketch. This is a down-to-earth nature cruise, taking you off the beaten track to give you a real taste of the marine environment and the beautiful landscapes of this unique coastal region in the Far North of New Zealand. Explore the ocean under sail, visit uninhabited islands, kayak and snorkel the clear waters to see amazing marine life, walk deserted beaches - or just sit back and relax! Prices start at an all-inclusive NZ$ 725.00 per person. Thank you for sharing your love of the sea with us! You have truly inspired not only myself, but our kids as well. They learned so much and had the most amazing experience. Thank you again for the memories that will last us all a lifetime. Best wishes in all your travels. Thank you so much for the time of my life. I've never done and seen so much in three days. I had a wonderful time and I can't thank you enough.